Every dot creates a constellation of discovery uncovered through the field of deep radical inquiry within one’s self. It is how the strength of the new series of works by Australian contemporary abstractionist, Elle Divine, embody a certain gravitational pull in the sense of experiencing the layering process of her works and the inter-marriage of the ‘spirit’ of indigenous art and the innovative medium of digital photography. The channelling of inspiration starts with a single dot. The mapping of ‘herstory’ starts the same. “Mapping the history of Herstory” is the jump-off point for Elle Divine’s first solo art exhibition in the Philippines that is currently on-going at Kri – a restaurant and a dedicated art space owned by Ritchie and Iris Armogenia (an artist herself) in Dumaguete City. 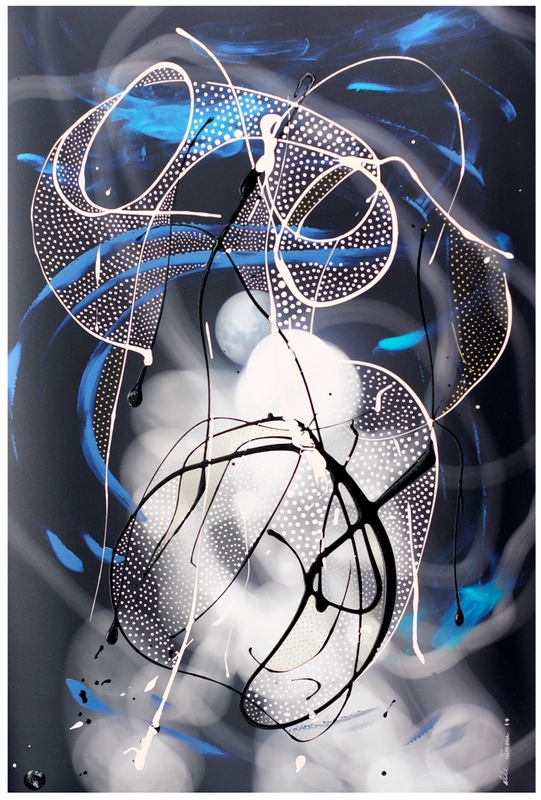 Elle’s experimentation implies a virtual mapping of instinctual conscious exploration ignited by spontaneous striking of paints on C-prints and on canvas and the meditative process of ‘dotting’ – which flowed in through the influence of ethnic-primitive art and the traditional batik process of the Balinese artisans (of her having lived in an ashram in Ubud, Bali-Indonesia for the last seven years). A palpable experience on a trip to Uluru (Ayer’s Rock) and Kata Tjuta in Central Australia has catapulted into a bolder step to powerfully claim a sleeping creative muse within and has now sprung up to life echoing the voices of the ancient in each dot, in each line and curve, in each hue of colour (primarily using red, yellow, black, and white) that replicates the symbolic pigments used by ancient tribal councils – from Africa to Down Under (tracing the exodus of the DNA imprint of the human migration). The element of Fire adds a certain degree of intensity to the artist’s art process. While living in Bali, Elle is known for her process of dancing over canvas and this continued exploration of movement is applied in her works for this exhibition. Elle has utilized the camera while moving around the fire clicking away while dancing and in the process inscribing light trails on the photographic image which becomes the first layer of blueprint to add on layers upon layers of spontaneous transmissions of paints and dots. Whitney Fleming, designer and social entrepreneur, describes her experience of the exhibition in one word: EXPLOSIVE. She adds, “all together, it’s very volcanic – to use the term – there’s a lot of energy in them. It felt that way. I also see a juxtaposition in the groupings of the collection. 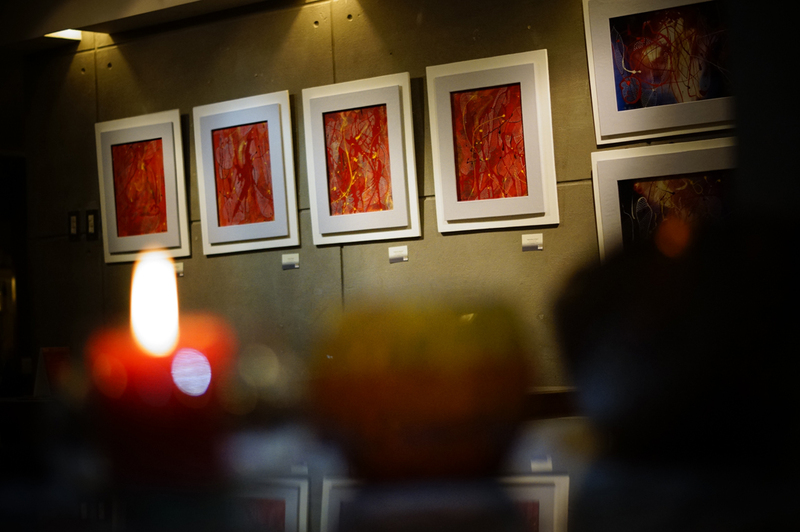 The ‘red’ ones (fire and light) are very explosive while the ‘black’ ones with the dancing moon (photographs by Ra’z Salvarita) has got the calming and subdued – a serenity – tone yet still having a powerful energy behind them. She also points out her sense of engagement in viewing the works by saying that by looking at the red pieces, she has to ‘distance herself away from the piece’; while the black pieces exude a sense of ‘invitation to come much closer for a more intimate appreciation’. It helps to ‘take a breath and surrender’ to the unfolding discovery of seeing ‘heart-to-heart’ the essence of the work as there are range of emotions that gets revealed as one looks closer beyond the physicality of the eyes. There is a certain aesthetic intelligence that overrides the interaction and deeper understanding of the visual imagery that the works of Elle Divine emanates. The playful coding in giving the titles for each work creates a narrative that interweaves a bridge of connection with the work, the artist, and the witness. “There are no mistakes or accidents,” Elle would say. Indeed, in her trips around the planet, certain vortex of energy pools has brought about shifts in her art process – from a ‘spiritual birthing’ cave in Uluru-Kata Tjuta, Australia; to a dwelling cave in Qumran and the Dead Sea and the Old City in Israel; to meeting the oldest mananambal in Siquijor Island; and to many other portals that contributed to her ways of ‘seeing’ beyond the physical form of her works to feeling the ‘soul’ that constitutes the expansive representation of each work. Art, as we know it, when taken off the context of human description is pure creative life-force energy utilized to imprint symbols – and takes form like a painting, photograph, or movement. With Elle’s art pieces, the Divine is captured in the process and emancipates a transmission of extending the “good, the holy, and the beautiful”. Claim history. And take part in the Herstory.